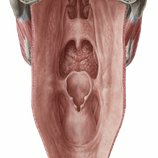 Pharynx - want to learn more about it? The pharynx, more commonly known as the throat, is a five cm long tube extending behind the nasal and oral cavities until the voice box (larynx) and the esophagus. Essentially, it forms a continuous muscular passage for air, food, and liquids to travel down from your nose and mouth to your lungs and stomach. The functions of the pharynx are accomplished by two sets of muscles which help push the food bolus further down the digestive tract. In addition, they also help with swallowing and speaking. In this page, we will learn more about the anatomy of the pharynx and its functions, including its main regions and muscles. Read the following article and watch the video to learn more about these three regions and their anatomical landmarks. Innervation They are all innervated by the pharyngeal plexus and pharyngeal branch of the vagus nerve, except the stylopharyngeus which is innervated by the glossopharyngeal nerve. Functions They all act on the pharynx, either constricting or elevating it. All the muscles of the pharynx help to push the food bolus towards the esophagus during the act of swallowing; either by contracting, or by shortening the pharynx itself. Some of the muscles also help with speaking. Take a look at the next video and article to get a better understanding of how the pharynx muscles are organized and work. They supply the pharynx by either passing in close proximity to it, or by sending out ascending and descending pharyngeal arteries. In addition to these arteries, there are others that are closely related to the pharynx but do not necessarily supply it with fresh blood. The venous drainage of this region is via the external palatine vein which drains into the pharyngeal plexus. In turn, the latter finishes in the internal jugular vein. Watch the following video to learn about all the blood vessels around the pharynx. Arteries and veins of the parapharyngeal space. The pharyngeal branches of the vagus nerve provide motor innervation to all the structures and muscles of the pharynx, except the stylopharyngeus. The latter receives motor innervation from the glossopharyngeal nerve. In addition, the pharyngeal branches of the glossopharyngeal nerve provide the majority of the pharynx with sensory innervation. The exception is the nasopharynx; its anterior and superior parts are supplied by the maxillary nerve. Watch the following video to learn all about the nerves of the pharynx. Overview of the nerves of the pharynx. If you have been paying close attention, you should be familiar with the functions of the pharynx. The tubular structure of the pharynx makes its main function quite obvious - to facilitate the passage of air, solids, and liquids from the nose and mouth. Therefore, the pharynx functions in both the digestive and respiratory systems. The muscles further provide help by facilitating peristalsis (constrictors), together with swallowing and speaking (longitudinal muscles). Tackle the following custom quiz about the pharynx to test your newly acquired knowledge. It contains all the relevant aspects: muscles (attachments, functions), arteries, and veins; mixed up randomly to offer you the ultimate challenge on pharynx anatomy. This article discusses the anatomy and clinical aspects of the parapharyngeal and retropharyngeal spaces. Learn more about them at Kenhub! This article covers the muscles of the pharynx, focusing on their anatomy, origins, insertions, innervation, and actions. Learn all about them at Kenhub! This is an article covering the anatomy, embryology and clinical notes related to the pouches, membranes and clefts of the pharynx. Start learning now. This is a clinical case of pharyngeal diverticulum that caused dysphagia and odynophagia. Click here to learn this interesting story at Kenhub!